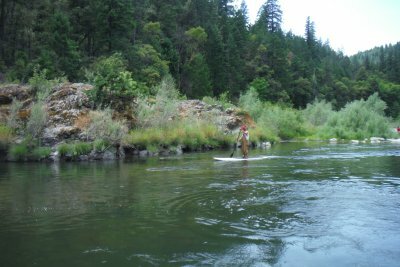 The beginnings of this story date all the way back to 1985, the year after I arrived on the Klamath River. 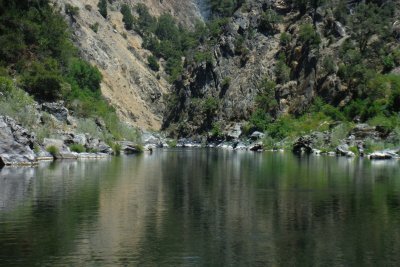 That is the year I bought a jet boat and gained access to the remote canyon on the Klamath River not far downstream from the confluence of Independence Creek. 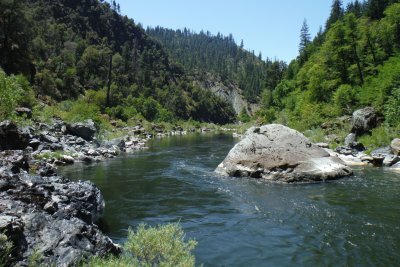 That’s about 12 miles downriver from Happy Camp in northern California. 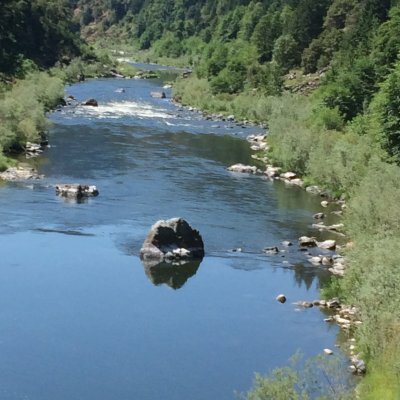 In those days, nearly all of my personal income was generated from suction dredging in the rich high-grade river-bottom gold deposits that were pretty consistent along that stretch of the Klamath River (and remain so). We did not devote any meaningful time digging for gold in the surface deposits in those days. This is because we were busy dredging. 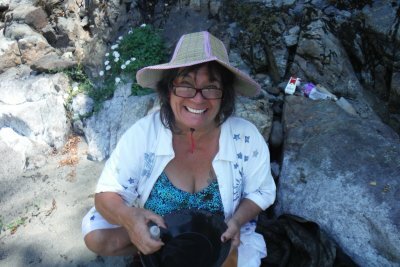 But once in a while, someone would dig out a crack in the bedrock up on the side of the river, and we recognized that the very same gold deposits we were dredging under the water extended right up out of the water alongside the river. Our first season with The New 49’ers was during the summer of 1986. Since then, for the most part, my responsibilities with the Club did away with my commercial suction dredging career. I don’t have any regrets about that, except that I would surely love to see cracks full of gold at the bottom of the river once again before my own final chapter is over. 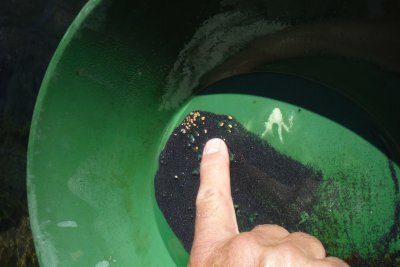 Uncovering rich deposits of gold is one of the most exciting things I have experienced during my time on this earth! Over the years that followed, we have acquired an extensive amount of mining property, including nearly all of the mining property that extends its way through that entire 3 ½-mile stretch of mostly remote, gold-rich lower Independence Canyon. I say “remote,” because the river winds its way down through more of a wilderness experience that is further away from the road. Most of the stretch is not even visible from Highway 96. There are some old mining trails that go down to the river here and there. But it is only during these last two mining seasons that any members have even taken very much notice. 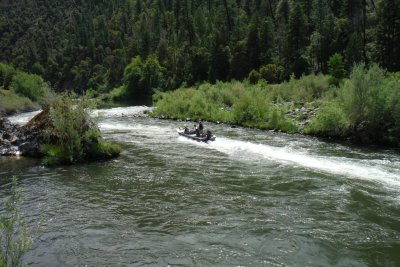 Even with the advantage of a jet boat, very dramatic rapids at the upper and lower ends of the canyon prevent deeper motorized access during the low water periods of the year. If you want to venture into the deeper canyon where almost no prospecting has been done, you either need to float in with a rubber raft, hike in over one of several trails, or use a rope to climb in and out from places where the road is close enough to gain some access. My own interest in the surface mining potential down in the Independence Canyon peaked from a series of events which have taken place this season. First, a group of experienced members and I used my jet boat to gain access to the far side of the river on K-23AA earlier this summer – and in just a matter of an hour or so, we confirmed an abundant surface deposit which we are now mining during the weekend group projects. In that place, we have set up one of our over-sized rubber rafts with an outboard engine to ferry participants back and forth across the river. Here is the story. Other members have since moved onto K-23AA and are using different types of boats and rafts to gain access to the richer deposits on the far side of the river. In almost 30 years of managing The New 49’ers, we have not paid much attention to the far side of the river. This was because we figured it was too difficult for most members to get over there. This perception changed when I saw how easy it was for John and Curtis to paddle across! Several weeks ago, I received an email from Melissa Pemberton saying that she would be stopping in Happy Camp to introduce her husband, Rex. 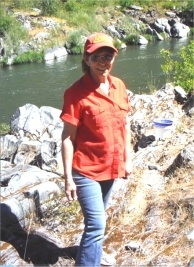 Melissa grew up devoting long summers with her extended family and close friends (there were at least 10 children between the Andrzejewski and Kohler families) extensively dredging for gold along the Klamath River. We all became very close friends. Children grow up and pursue other interests for a while. I say “for a while,” because I am amazed at how many kids grow up spending summers mining gold with us, and then return later as grownups and bring their own children to join with us in the great outdoor gold mining experience. Even though I had not seen Melissa for a number of years, I have remained in touch with her parents, and I have followed her web page. Talking about extreme adventure, Melissa makes her money these days as an aerobatic pilot. She participates in competitions and puts on shows all over the world. You guys have probably seen the way they can put these stunt planes into summersault rolls in the air? That’s what Melissa does, while flying circles around her husband that is in freefall through the air. Unbelievable stuff! When Melissa said they were coming to Happy Camp, I invited them for a jet boat ride down into the Independence Canyon where we could provide Rex with his first really good gold prospecting experience. They were excited about that, and so was I. For me, the excitement was more about discovering how a close friend as a kid had grown up into an adult 15 years later. After introductions over some local (great) pizza in Happy Camp, we drove down to Independence and launched my boat. I took an immediate liking to Rex the moment I met him. He has this unassuming, natural, friendly way about him, while also giving the impression that he is quite capable of doing his part, no matter how difficult the task. Melissa is the same straight-up, happy personality as I remembered her as a kid. I was really happy to see that all the good stuff was still there. Running the river in a jet boat! We raced about a mile and a half down into the canyon until we reached “Dragon’s Tooth,”a class 4 rapid, which is really about a 10-foot drop in the river (waterfall) with big ugly teeth protruding out in the center that make it nearly impossible to traverse with anything but a rubber raft. Even the rubber rafts sometimes don’t make it. Check this out! I say “nearly impossible,” because I have been through Dragon’s Tooth with a jet boat several times. Never again, though. You take more risks when you are young and invincible! 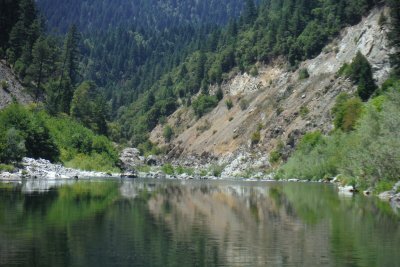 Since we were not going to go further downriver, the three of us looked for a stretch of exposed bedrock on the far side of the river where we could dig out a crack in search of gold. It didn’t take long to find one. Shortly thereafter, Rex was busy prying rocks free while I was wishing we brought along a pry bar. The rocks were jammed tight in the crack. I might have given up on the location; but Rex’s enthusiasm paid off, and pretty soon we were screening material into a gold pan. Rex kept digging while Melissa watched me pan the material down. 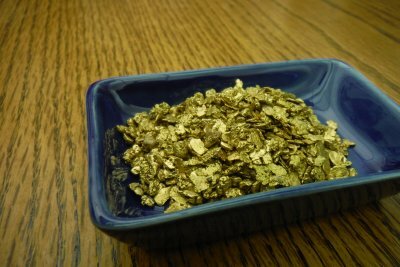 I fully expected to uncover a good showing of fines; but when I swished the material around in the bottom of the pan to see what we got, both Melissa and I lost our breaths as several sizable flakes of beautiful raw gold were uncovered. It was one of those “too good to be true” moments. Both Melissa and I looked at each other and burst out in laughter, fully enjoying that moment of excitement and the renewal of long-established friendship. Rex had piled up another pan’s worth of material by the time we returned. When we showed him the gold, he let out a yell of exhilaration! Too bad the gold is not that rich everywhere we dig! Melissa & Rex, Gold from just 4 pans of material out of a bedrock crack! It took us the better part of an hour to clean out the bedrock crack. The material was screened and panned. I gave Rex a refresher panning lesson on the fourth and final pan. He took right to it. 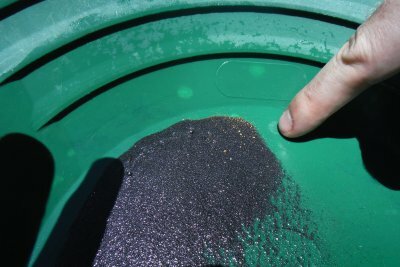 I have to say; in all my years of gold prospecting, there have not been many places that turned up that much flake-size gold in just four pans. We were all feeling really good. Me especially, because I wanted to treat Rex and Melissa to a good experience. Afterwards, we just relaxed there for a while enjoying the surroundings. These canyons alongside the Klamath River are about as good as it gets in the Pacific Northwest. An osprey flew over us screaming out its own success of the moment. We could see that she had a fish in her claws, probably on its way to feed her babies in a nest high above the river. That’s what got me thinking more about the more remote mining properties we have in The New 49’ers. We have several of these extensive canyons. It is a lot of effort to get into them if you don’t think you are going to find any gold. But if you knew how much gold we were recovering out of that exposed bedrock, it would be rather easy to get over there! I brought the subject up to Rich Krimm and John Rose on the following morning. Those guys are always up for prospecting adventure. We started coming up with ideas about lowering rubber rafts and even smaller aluminum boats (with prospecting gear tied inside) down the hillsides into the canyons. I remember in the early days of The New 49’ers that we had some aggressive members who tied off a pulley on one vehicle. Then they ran a rope down to a small trailer in the canyon up through the pulley and used a second vehicle to pull the gear right up the hill. It’s not as hard as it would first seem, as long as you know there is a golden prize on the far side of the river! Rich said, “Heck, I have a portable, plastic kayak I can put on my back while I lower myself down the hillside, and I can be digging on the far side of the river within 30 minutes!” I’m guessing it would be more like an hour. But if I made a bet with Rich, he would surely win! 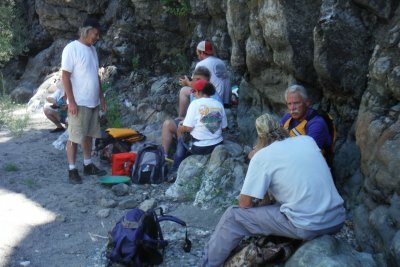 So I suggested we pull a prospecting team together and use one of the Club’s large rubber rafts to run the entire Independence Canyon on a day-trip and see what kind of gold we could find down there. That was a heck of an idea! We started organizing right away. Rich and John lined up a bunch of our more experienced prospectors, adventure lovers and some of our most loyal Club supporters. 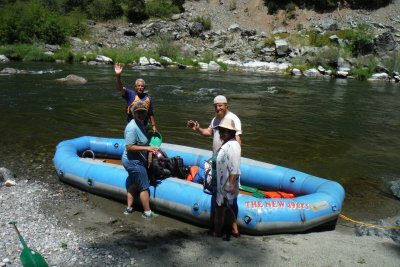 We did our first canyon float just a few days ago with Rich and John, Diane Helgesen, Robbie Collum, Connie Krimm, Steve Jones, Josh Collum and Derek Eimer. I went along to steer the boat. 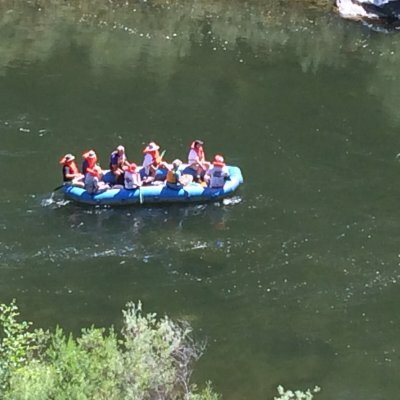 Though I will admit that even though I tried my best, when you put 9 people in a big rubber raft, it pretty much goes where the Klamath River wants to take you! I believe this was just the first of many more trips to come. One of my own objectives was to see how difficult this canyon is to travel by rubber raft. It’s not so bad, but life preservers are a must! I wanted to see how long it takes to float the 3+ miles. It’s maybe just two hours if you don’t stop to prospect or enjoy the surroundings. All of us wanted to see how good the prospecting is down there. 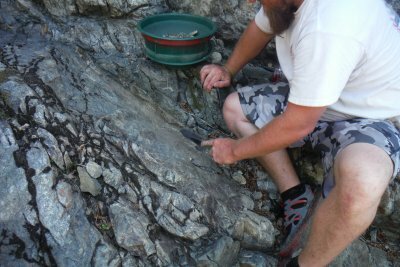 I can tell you that the prospecting is really good in some of the areas where we stopped. The opportunities are so extensive that we could devote the rest of our lives down there and not prospect it all! 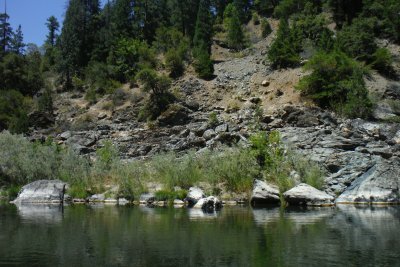 There are long stretches of exposed bedrock on both sides of the river, most which have never been touched by modern gold prospectors. 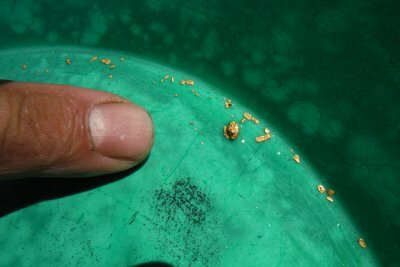 Some of these places are producing nice, larger flakes of shiny gold, and even some nuggets. I’ll bet we would find large nuggets if we devoted more time, especially to underwater prospecting. 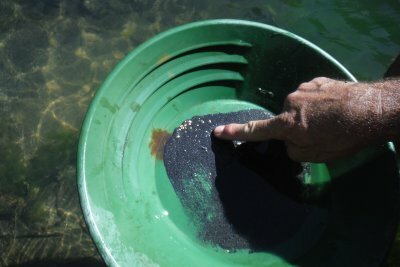 Some places are producing hundreds of colors of fine gold in each pan. All you have to do is dig out the cracks! Even the place where we stopped for lunch was producing gold right out of a crack alongside the wall where we were sitting. All the adventure and gold aside, the part of the experience that impacted me the most on this trip was being surrounded by the wild remoteness of the outdoors once we got deep down into this canyon. Steep walls tower up out of sight as the river takes you through a place where few people have gone before. The best I can describe my own experience is similar to the majestic and humbling feeling I have when I stand under a mature redwood tree, so large and old, having been alive for more than a thousand years. This quiet, massive, hidden canyon has been keeping her secrets safe much longer then the oldest redwoods on this planet! There is not only gold to be found down there. You can rediscover parts of yourself and internal, almost-magical feelings in places like this that you forgot you even had. It would be almost spiritual to spend a night or two down in that canyon; something to think about. As we were floating through this wondrous place, just before we reached the final rapids that would speed us back to civilization; I was feeling so lucky that we have these gold-rich canyons available to us. Interesting, after all these years, we have just gotten around to them! We performed the prize drawing from the most recent New 49’ers Legal Fund drawing at our July 5th Saturday evening potluck in Happy Camp. The event was fully attended by a very lively bunch. Winners can make contact with Montine in our office at 530 493-2012. I want to give a sincere thank you to everyone who has contributed to the New 49’ers Legal Fund during these past several months, and especially to the army of you who responded to our calls during this past week. You guys have never let us down! If it were not for you, we would not have the resources to fight for small-scale gold miners. Next 25 drawing prizes will be made up from these 3 ounces of Dave Mack’s gold nuggets! Even though we can write it off as a successful legal fundraiser, this one only produced 2/3 of the revenue that The Legal Fund normally brings in on similar legal fund-raisers. I take this as a sign that maybe you guys are getting bored with gold and silver coins. We all know that legal fund-raising is less about the prizes, than it is about generating resources to pay the very best specialists to defend small-scale miners against extremists who want us off the public lands. Having said that, we also know that valuable prizes create a fun and interesting incentive for you guys to participate. 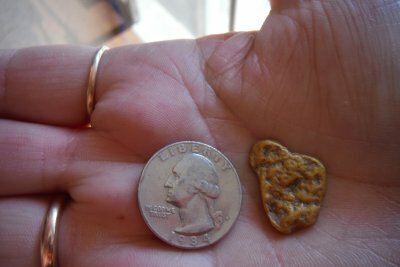 Therefore, the newest fund-raiser (already in progress) will be for 3 ounces of beautiful gold nuggets that I personally dredged off the bottom of the Klamath River. Our office will automatically generate a ticket in your name for every $10 legal contribution we receive ($100 would generate 10 tickets, etc.). Any contributions received after noon on July 5th will automatically generate tickets for the new drawing. This drawing will take place at the close of business on 31 October 2014 (Halloween). You do not need to be a member of our organization to participate. You do not need to be present to win. There is no limit to the size or frequency of your contributions, or to the number of prizes you can win. Several other members and I accompanied our attorney on June 24th & 25th for 2 days of Mandatory Settlement Discussions in San Bernardino for the several ongoing cases in front of Superior Court Judge Ochoa. Before I get into this, I need to point out that the discussions were confidential, so I can only discuss this in general terms. As an important part of this, in case you didn’t know, because of scheduling conflicts, oral arguments in Brandon Rinehart’s appeal to the Third Appellate District have been pushed back to September. In that case, we are petitioning the Court to decide that federal law prevents the State of California from prohibiting suction dredging on the public lands. We are arguing that the law is already well-decided on this issue. One of the State’s primary arguments is that they are only prohibiting suction dredging, and we are still allowed to use our gold pans. Our position is that our mining claims are only valid in the first place because we have made viable gold discoveries at the bottom of waterways which can only be reached through suction dredging. Preventing us from extracting the gold deposits we have discovered is basically a prohibition on the use of any effective method of mining that is available to us. As long as we get a fair hearing, and it appears as though we will, we are pretty confident that we will win the federal preemption case in the Third Appellate Court. The case law we are relying upon says that while the State has the authority to impose “reasonable regulations” upon us, they cannot prohibit mining altogether. This brings up the subject of what constitutes “reasonable regulation” of suction dredging in California. While maybe everyone does not agree, many of us believe that the regulations we worked so hard for in 1994 were reasonable, except that the Department of Fish & Wildlife (DFW) decided afterward that the Special Permit process was no longer available to us. Please allow me to put this in perspective: A statewide suction dredge permit scheme is good for our industry. Otherwise, each of us would need to submit separate dredge applications for each different place we want to work. The process of obtaining those permits could be quite lengthy, burdensome and expensive. For example, the previous judge that was presiding over most of this litigation was strongly suggesting that every single suction dredger should be required to do a full Environmental Impact Report (EIR), a requirement which would certainly have been the end of our industry. You guys probably recall that Brandon Rinehart was cited several years ago for suction dredging without a permit. Our attorney, James Buchal, took Brandon’s case. More or less, our defense is that the state has over-reached its authority by first adopting Section 5653 of the DFW Code which prohibits people from operating suction dredges within California’s waterways without obtaining a permit, and then passing another law which prohibits the state from issuing any suction dredge permits. If Brandon wins this argument in the Third Appellate, it basically means that we can all resume suction dredging without much worry over being prosecuted for not having a permit. I suspect this would prompt the legislature to cancel its moratorium and order DFW to immediately begin issuing dredging permits in conformance with the recently-adopted 2012 suction dredge regulations. I have read some recent comments made by others which are pushing the notion that Judge Ochoa’s Order for all the parties in the active litigation to participate in mandatory settlement discussions is a bad thing, especially since they will not be continued until September 4th & 5th. That means we will not be dredging this season. The reason for the delay, as I understand it, is the very same scheduling conflicts that delayed Brandon’s case in the Third Appellate. It is basically the same group of attorneys in both cases. People take vacations during the summer months. Yes; I know that does not include suction dredgers. But, since we are not going to resolve this without the attorneys, it is a waste of time to make a big deal over things we cannot change. We are so late in the season already, under the new regulations, there was not going to be much time for anyone to get in the water this summer, anyway. Perhaps it is better that we dwell on the good side of this. The good side? This is where others might disagree with my perspective. Civilized disagreement and debate amongst us is a good thing. We do this all the time within the industry. It increases all of our awareness on the issues we face and improves our ability to deal with the obstacles we must overcome. When I look back at how much better we are today at managing legal challenges than we were in the 1990’s, I am amazed we actually overcame the very strong push to eliminate suction dredging and came up with a set of regulations that supported our industry for 15 years. We were very divided in our views back in 1994. But we did manage to pull together a united front on the important matters that we had to deal with. I am confident we will do that again this time. Now to my perspective: Since we expect that the Third Appellate is going to overturn the legislature’s moratorium on suction dredging perhaps sometime around the end of this year, the next big matter to resolve is what constitutes “reasonable regulation” of suction dredging in California. That matter is in front of Judge Ochoa. I believe this is one of the main reasons he has ordered Mandatory Settlement discussions. The beginning of the process this past month involved all the parties and attorneys communicating our views and concerns to the judge on a personal basis. I believe the judge was trying to discover how far apart we are and assess the likelihood that he can bring us together in a negotiated settlement that everyone can live with. I believe he now has a good understanding of the issues we must resolve. Before we closed on the second day, he asked for a list of issues that each party would like to see changed in the 2012 regulations. After reviewing these with all the attorneys, he still had enough confidence to schedule two more days of settlement discussions in early September. We are in need of a part time person in our administrative office (in Happy Camp, California). We need a person that has some background in accounting, particularly on maintaining an electronic balance sheet. We are using Microsoft Excel. Part time positions in our office normally evolve into full time positions if the person is interested. We would prefer to fill the position before the end of this summer if possible. Anyone interested can please initially contact Montine at 530 493-2012. We are in need of a caretaker (night security presence on our office property) who would like to plug in on the back corner of our building in Happy Camp in exchange for free electric, water & sewer connections. The person must have an RV (not much more than 30 feet). There are some minor duties involved. While we can be flexible, we prefer no pets. We are looking for someone who is not into the after-hours party life. We would prefer to find someone for this position before the end of the summer, who will commit for the upcoming winter months. Anyone interested can please initially contact Montine at 530 493-2012. Join Us for our Remaining Weekend Group Mining Projects! The remaining weekend events for the coming 2014 season are scheduled for August 2 & 3 and August 23 & 24. These events are free to all members. We appreciate it if you contact our office in advance to let you know that you will attend: 530 493-2012.